Your device is only as good as the electricity inside it. Or something like that. So, when it comes to charging phones or plugging in laptops, do you need an adapter for Vienna and Austria in general? Austria uses Schuko / Type F sockets, as pictured below. It’s the same 2-pin system as in much of continental Europe, including Germany, Greece, Portugal, Sweden, and Spain. These sockets take the equivalent 2-pin Schuko or Type F plug, but are also compatible with the Europlug and the CEE 7/7 plug. 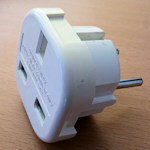 This means visitors from the UK, for example, need an adapter to fit a British plug to an Austrian socket. Visitors from the USA, for example, typically need a combined adapter and converter, since the standard voltage in Austria is higher than in the US (at 230 V): the standard frequency of 50 Hz is different, too. Where can you get travel adapters? If you haven’t brought the appropriate adapter, then your accommodation may be able to lend you one. There’s also a newsagent in the arrivals hall at Vienna airport. It sells books (also in English), international papers, and…travel adapters (at least they did when I last flew). Look for the “Schmitt & Trunk” signs when you exit from the baggage area. In town, the large electronic department stores stock travel plugs, adapters and similar accessories. The two main chains are MediaMarkt and Saturn. You might find what you need in the smaller independent electronic stores, too, but I’m sceptical.